This model is discontinued. 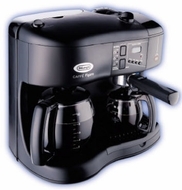 As an alternative, we recommend the DeLonghi BCO120T Programmable Espresso / Coffee Maker. ALL-IN-ONE MACHINE can brew coffee and espresso simultaneously. Also prepares cappuccino, latte or hot chocolate perfectly. PATENTED INSTANT FROTH DISPENSER lets you add froth right in the same cup as your coffee or cappuccino. ADVANCED WATER FILTRATION AND DECALCIFICATION SYSTEM gives you the best-tasting coffee and cappuccino. Automatic decalcification indicator light lets you know when itÆs time to clean the machine. VARIO SYSTEM AND ACCUFLAVOR SELECTOR DIALS allow you to choose the strength of espresso and coffee just the way you like it. ELECTRONIC PROGRAMMABLE DIGITAL TIMER allows you to set the machine to turn on at a later time. Even sets to the exact minute. PERMANENT GOLD TONE FILTER is easy to clean, brews superior-tasting coffee and eliminates waste. YouÆll never have to buy disposable filters again. ADJUSTABLE STEAM EMISSION for espresso or cappuccino includes pressure safety valve to ensure safe operation. REMOVABLE TANK for convenient filling and easy cleaning. DRIP INTERRUPT, WARMING PLATE AND 5-10 CUP FUNCTION. Drip interrupt lets you have a cup before the pot is done brewing. 5-10 cup option adjusts the heating element to prevent overheating of smaller quantities.